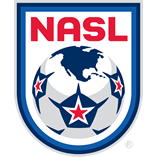 New York Cosmos forward Raúl, Fort Lauderdale Strikers midfielder Marlon Freitas, and Carolina RailHawks midfielder Tiyi Shipalane all scored goals to lift their teams to victories. Raúl and Freitas provided goals en route to clinching postseason seeds – No. 1 for the Cosmos and No. 4 for the Strikers. Shipalane scored and assisted in front of new ownership in Carolina. GK: David Meves (Fort Lauderdale Strikers) – With the Strikers fighting for their postseason lives, Meves provided exactly what the side needed. The Illinois native made four saves and kept a clean sheet to help Fort Lauderdale to a 1-0 win against Jacksonville Armada FC to clinch the No. 4 seed in The Championship. DEF: Rovérsio (New York Cosmos) – The Brazilian center back has been beset with injuries this season, but he made his presence felt on the final weekend of the Fall Season. Rovérsío helped shut down the Tampa Bay Rowdies as the Cosmos kept a clean sheet, and by virtue of a 2-0 win, claimed the No. 1 seed in the postseason. DEF: Kevin Venegas (Minnesota United) – The attacking fullback scored in the nick of time to level for Minnesota in a 2-2 draw with the San Antonio Scorpions. The California native connected with Kalif Alhassan’s free kick before it was deflected into the goal. DEF: Jordan Graye (Fort Lauderdale Strikers) – The native of Washington, D.C., has solidified the Strikers’ back line when in the lineup, and he had another strong performance against Jacksonville. Graye was vital in keeping the Armada FC off the scoresheet as Fort Lauderdale turns its attention to the postseason and a semifinal match against New York. MID: Billy Forbes (San Antonio Scorpions) – The dynamic wide player added his team-leading eighth assist of the season when he slotted a ball across the face of the goal for Giuseppe Gentile to tap home. The Turks and Caicos international put the Minnesota defenders under pressure all game long. MID: Marlon Freitas (Fort Lauderdale Strikers) – The Brazilian midfielder sealed the Strikers postseason place after scoring in the 87th minute in the win over Jacksonville. Freitas showed good strength to create the chance and had an overall strong showing in midfield. MID: Tiyi Shipalane (Carolina RailHawks) – On the day he re-signed with the club, Shipalane showed his attacking ability on his goal in the 3-1 win over Indy Eleven. The South African created several chances as the RailHawks closed out their season on a strong note and assisted on the game’s opening goal. MID: Junior Burgos (Atlanta Silverbacks) – The Salvadorean midfielder proved dangerous once more from set pieces against Ottawa Fury FC. Burgos curled an effort over the wall and into the top corner for a goal with the first shot of the match in the 1-1 draw with Ottawa. FWD: Raúl (New York Cosmos) – Shining in key moments has never been a problem for the Spanish star, and he did so once again for the Cosmos. With New York needing goals to offset Ottawa’s goal differential, Raúl scored the game’s opener, which set the Cosmos on their way. On the same night he was honored, he was lively throughout the match to help New York claim the No. 1 seed. 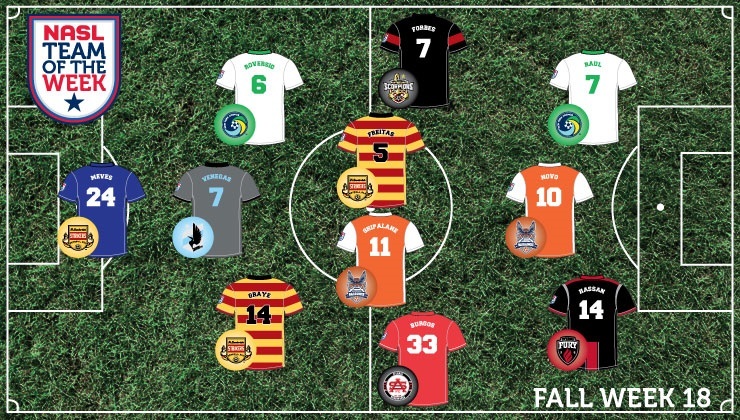 Raúl also earned Player of the Week honors. FWD: Nacho Novo (Carolina RailHawks) – The Spanish forward helped ring in new ownership with a bang, scoring early in Carolina’s big win over Indy. Novo finished the season with 11 goals, the third-best goal record in the league. FWD: Aly Alberto Hassan (Ottawa Fury FC) – The Florida native scored to extend Ottawa’s record unbeaten streak on the road to 12 games. In a match that didn’t feature a plethora of chances, Hassan pounced on his own rebound to slot the ball through Atlanta goalkeeper Steward Ceus’ legs to overcome an early deficit.